One of the earliest particles beginners encounter in learning Korean is 만. It is attached to nouns to express “only” as in 나만 겨울이 좋아 (Only I like winter), 오빠는 나만 보여 (My brother only sees me), and 너한테만 보여 줄게 (I will show it only to you). It is this easy to say “only” that I wouldn’t need to write one whole note for this. I could just share it on Facebook, right. But I know you know that you are not leaving this note without learning something new and I do hope you will. 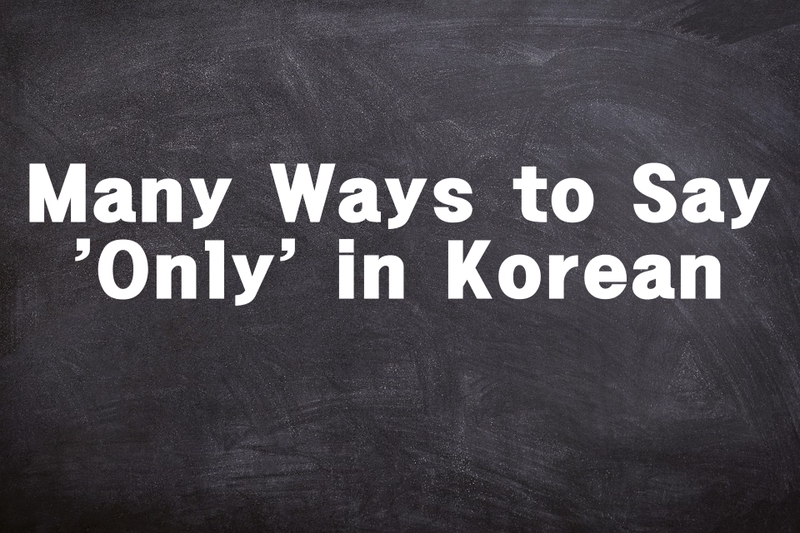 Aside from 만, I will show you a few more ways to say “only” and after that your Korean will never be the same again. The second way is –밖에 안. 밖에 is attached to a noun and 안 is succeeded by any verb. To better understand this, let’s take a look at one example. 동찬이가 트와이스 노래밖에 안 들어. If we remove the part 트와이스 노래밖에, what is left is “Dongchan does not listen to (anything). The purpose of 밖에 is to say that something is an exception. Hence, it literally means “Dongchan does not listen to anything apart from Twice’s songs” which basically means “Dongchan only listens to Twice’s songs”. Here are some more examples. I only know this. This is all I know. (모르다 is also a negative verb). 다이어트 때문에 우리 누나가 아침식사밖에 안 먹어. My sister only eats breakfast because she is on a diet. Another way of saying “only” is -ㄹ뿐이다. It can be attached to the ‘be’ verb, active and state verbs. Here are some examples. 제가 한국말 잘하는 것은 꿈일 뿐이에요. Being good at Korean is just a dream. 내가 하고 싶은 건 너랑 같이 살 뿐이야. The only thing I want to do is live with you. 이민호가 잘생겼을 뿐이야. 연기를 좀 못해. Lee Min Ho is only (just) handsome. He's poor at acting.